Sea, Swallow Me. Brian Edmonds, 2016. 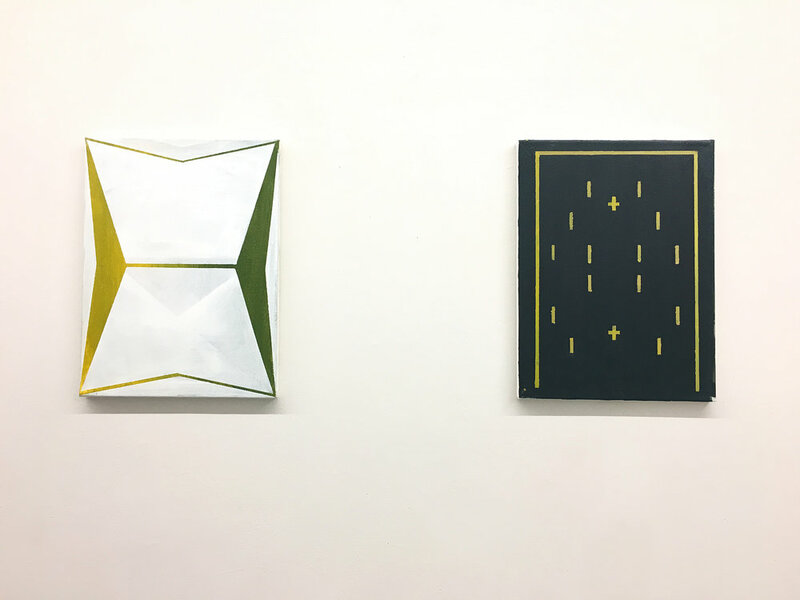 “Transversal,” Fluorescent Gallery’s latest exhibition, features the abstract geometric paintings of Brian Edmonds and Alex Mcclurg. Expert organization by the show’s curator, Ashley Layendecker, illuminates the points where the two painters converge and diverge in practice. Both painters leave a trail of evidence in each piece, revelations of process that speak clearly to one another, and yet show vastly different approaches to materiality, form, and visual language. Materially, both Brian Edmonds and Alex McClurg are loyal to the record of human touch, exposing blemishes in the paintings, displacing patterns, and breaking concrete forms to oscillate between undermined and reinforced continuity. The subtle physicality of the paintings can really only be experienced in person. One process in particular embodies the main aesthetic divergence of these two painters: the use of tape to mask off forms. The act of masking signifies a goal of precision, an unwillingness to yield to human error. Yet, the handling of masked forms in “Transversal” functions to turn that signification on its head. Meticulous masking is evident in both painters’ work, but it achieves a different goal for each. For McClurg, it announces a careful tenderness towards the paintings: pristine patterns are painstakingly arranged, and sealed so perfectly that the viewer is left questioning the feasibility of forms. A feeling of serenity through meditation is achieved, and in the comfort gained from apparent concentration and patience, McClurg’s nostalgic nod to quilt-making and old books radiates. Goodnight, Wherever You Are. Brian Edmonds, 2016. Tenderness announces itself from the opposite direction in Edmonds’ work. While he masks forms with similarly intense attention to detail, the process itself is handled in a way that subverts its purpose. Dynamic masked lines are riddled with blobs where paint has run under the tape. Traces of hard edges bleed into mashed colors, aberrations are inflicted upon the forms by the tape itself, which previously signified cleanliness and perfection. The painter’s endeavor to contain causes disturbance in the painting, which ultimately rejects the pristine, and reveals the painting's inner lineage. In the painting’s “overpowering” of the tape, it establishes itself as a vital object, alive with touch. No Trace. Alex McClurg, 2017. Alex McClurg’s paintings are carefully formed layer by layer, precisely planned, meticulously masked, substrates perfectly sewn from denim and linen. Differing textures within each painting create a serene dynamism and reveal the process of their making. McClurg’s “Transversal” works were made in reference to geometric book covers from the 60s and 70s, and the tradition of quilting. His focal colors were lifted from a moment where he saw a perfectly arranged stack of grey, yellow ochre, and pink fabrics. Mcclurg’s work hints at a triad harmony that, if used in full saturation, would tend to suspend emotion due to the stability and universality of its meaning. The addition of flat grey indicates a very careful approach to color, and hues are adjusted just enough to cause a nostalgic feeling to arise in the viewer. The careful balance of color - yellow turned down to a golden ochre, pink lifted to a soft, bright shade - creates a delicateness which sustains the dynamic angularity of the compositions. Not I (Detail). Brian Edmonds, 2018. Edmonds organizes his compositions on-canvas, starting at the edges and working in. Color is intuitive, decided, and surprising. It functions almost in an auxillary way, to support a transferal of symbols and shapes rather than the conveyance of particular emotions. The communication of his own specific ideas and feelings is not as important to Edmonds as compelling the viewer to personally identify with forms and space in an open-ended way. Colors in Edmonds’ paintings are almost an obfuscation of the delicacy embedded in each painting. Bold and decided hues proclaim a certainty that is quickly retracted upon closer inspection - stark, complete black gives way to peeps of brilliant blue, dark green brush strokes are just transluscent enough to reveal a hidden layer of pink. Color that once appeared total breaks open into a complex map of the painting’s lineage, a manifesto for the material and hand-made. Edmonds takes an almost sculptural approach to texture in his paintings, whose surfaces range from subtle revelations of past brush strokes, to carefully layered disturbances in the paint which are built up to look like gravel or sand. Both painters employ subtle displacement in their work. Edmonds doesn't measure, just uses an observational approach in the generation of forms, so the geometry itself is slightly off; lines converge where the eye wants perfect parallels. These small denials of perfection free Edmonds to experiment, change course, and thus impart breath into his paintings. With obligation dismissed, the viewer is invited to enter and discover a rich history and serene balance in each painting. For McClurg, the displacement of otherwise stable forms serves not only to create a dynamic composition, but to convince the viewer that the work is at once expanding and contained. This aspect of the work is enhanced perfectly by the size of the paintings. The small scale invites the viewer to accept the whole piece completely, simultaneously compelling the viewer to seek more information. The effect is to tempt the eye to enter as if through a passage of floating shapes, experiencing the full manifestation of patterns that extend far beyond the glimpse of space physically granted by the artist. 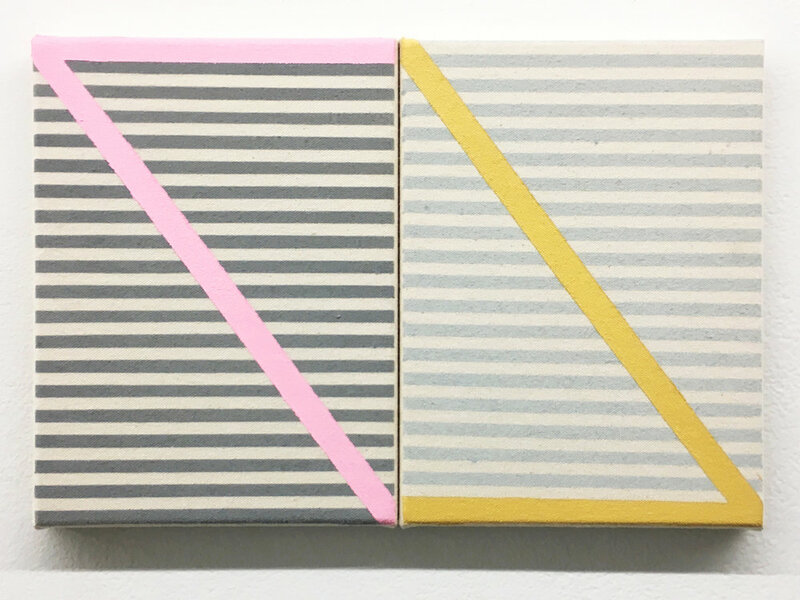 At the same time, McClurg reinforces the comforts of completion by implementing visual tools like flat grey lines which trace the edges of some paintings and declare them to be self-sufficient. In this way, McClurg and Edmonds can be compared to landscape artists, both portraying scenes from a whole, imaginary spaces that extend into undescribed but implied space. Edmonds references landscapes by Diebenkorn, and moments from Matisse where the space of the painting shifts between three dimensional and two dimensional views. A New Beginning. Alex McClurg, 2017. Both painters are employing a linguistic system of forms that functions by snapping into the viewer's recognition while suspending comprehension. One of McClurg’s stark yet subverted signifiers is the broken “X” motif which is employed in many of his paintings. The shape creates a mental contradiction within the viewer because it categorically blocks the path into a painting, yet McClurg has broken the form in a way that incorporates a dynamic arrow into the center of the “X,” a green light embedded in the red, compelling the viewer to enter and engage, and to suspend their comprehension of a universal form. A similar example in Brian Edmonds' paintings is the recurring “Z” shape that appears frequently in his composition. The shape is embedded in the work in such a way that it creates an irresistible moment for the mind to lock onto the painting. The shape is recognized, but its meaning suspended completely, as its formal elements are prioritized. Edmonds' catalog of linguistic motifs is always expanding, evolving with each painting, and the paintings therefore rely on each other. The repetition of visual tools, like McClurg’s “X” and Edmonds’ “Z,” functions to define an entire language of open symbols in an artists methodology. In the same way that language itself is created and sustained - repetition of arbitrary signifiers with an agreed-upon signification - the repetition of forms compels the viewer to admit that each motif is important, that it means something. Meaning is never relinquished by the artist and thus the paintings captivate indefinitely, their languages legible but not understood. Fluorescent gallery opened in summer 2005 under director David Wolff, as a neutral space to gather and talk about new and exciting work. It is located at 627 N Central Street in Knoxville, TN.